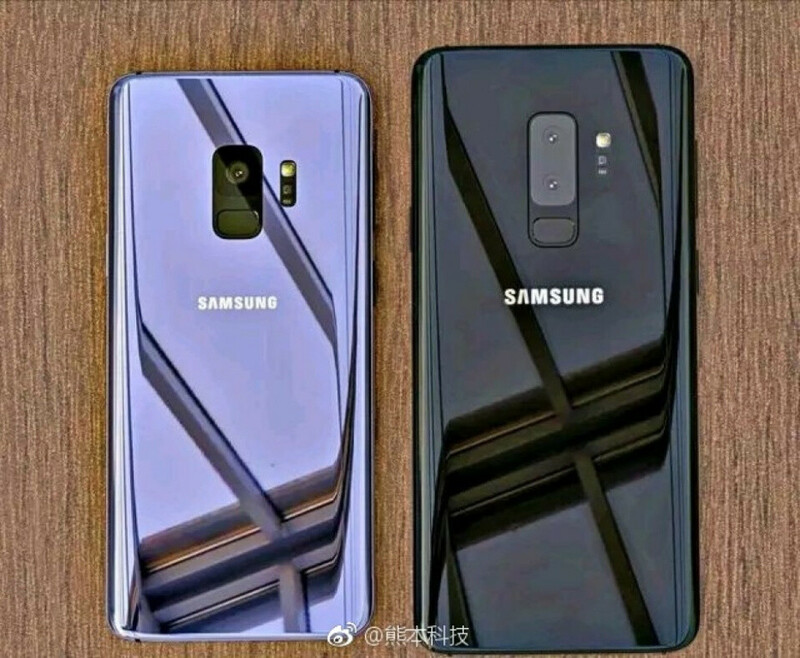 No, despite some reputable blogs portraying this blurry, low-res picture to be a "real" and "leaked" photograph of Samsung's next two flagship phones, this is NOT a leaked photo of the Samsung Galaxy S9. And it sure isn't real either. Just as other bloggers and journalists who received this picture in their mailboxes, we also got that initial kick of adrenaline that comes with having an early peek of a hot gadget that nobody has seen just yet. The low resolution of the photo suggested authenticity, as if someone was in a rush to take the picture, prosecuted by the secret Samsung police (yeah, we totally made this up), and the hard-to-trace link to a Chinese Weibo account directs us into depths that the average English speaker would not go into. But after that first-look excitement, it was obvious that something was wrong. The angle the picture is taken suggests that a camera reflection should be seen, so this was clearly a mock-up. Further investigation pointed us to an actually very well-made imaginary concept video by YouTuber Concept Creator. And voila, right there around the 2:20 mark was a high-resolution version of that picture. All imaginary, all just a concept. It's actually quite funny how a screenshot from a popular concept video made it into the headlines as a "leaked picture". The moral of this short story of a "leak" is more about journalistic integrity and careful check-up of sources, but it's also about warning readers who should be aware that the flow of such fake photos would only intensify as the launch of the S9 looms closer. Meanwhile, here is the masterful video concept that turned out to be the source of this photo. Let us once again clarify: this is an imaginary concept based on rumors, previous Samsung devices and pure fantasy, but it is in no shape or form "real" or "leaked". Dont post it if its not real. We usually do not, but since this was posted in other places, we wanted to make it clear to our readers that it's a fake. Plus, it's a fun story. you know I'm fine with this article, the article title clearly labeled it as fake and they did not use a click bait title "i.e. Is this the leaked S9? or something along that line"
I wanna see the Note 9. You & me both man. I love my Note 8, but I'd like to see what improvements Sammy's ready to make after playing it semi-safe with this phone. We don't have to be told these aren't real. We all know this. But I bet they are close. Maynot be real but i get it is ultra close to the actual design. Single camera on the S9, no thanks Samsung, LG G7 or Nokia 9 for me. Samsung Virtually No one like ultra shiny cases, matte colour please.